I met Shawn on a Saturday night, he mentioned he was in town for only the week and was here to find the best fish taco. This excited me. As a local, one of my biggest highs is showing the town off to noobs and cruising around seeing the city through the eyes of the traveler. The first time experience of Sunset Cliffs, the hearts feeling of repositioning itself during twilight at Seaport Village, lining your body up against the docked boats with a backdrop of silver and salmon colored sky. A walk around the cross at Mt. Soledad, the families the edge and teen spirit at the boardwalk. The bars the craft donuts the music scene and pretty bodies on gorgeous beaches, all of it too much to squeeze into a week itinerary, but this small goal to find the best fish taco?! That- I could most defiantly take on! Since I live in North Park the hunt began across the street from my dwelling at Colima’s taco shop. Coloma’s is where I go for my late night fix on burritos. The burrito themselves the length of my ten year old daughters arm! Their ‘del mar’ burrito is outrageous with breaded fish and shrimp inside a double wrap tortilla! The drive through line can be long and frustrating at times, but when your one burrito can feed a pack of four- it’s worth it! Next we went down Texas street to the infamous Kiko’s Place seafood food truck, a local secret that shared a parking lot with a liquor store. Here we enjoyed their free soup while waiting for our spicy fish tacos. I noticed a homeless woman had come by to pick up an order and explained to the cashier she’d “pay her the rest next time” the cashier was smiley and unaffected by the arrangement and wished the woman a good day. This place can get pretty crowded in the lunch hours that we were caught in, but no one in line waiting for their pick up seemed to mind. One man commented to another he has been going to this truck for eight years never missing a lunch break there. Eventually our order was called and we dug in. The fish taco was phenomenal! So much cheese sauce and spice, truly a unique hot taco I had yet to taste anywhere else, quickly climbing up the rating for best fish taco in town! Since Shawn was visiting from the midwest he was wanting to get in as much beach time as possible, so from Kiko’s we drove down the 8 and found our way to the Pacific Beach Fish Shop on Garnet. I had read some reviews on their Mahi Mahi Taco winning several awards around town. The unique blend of sweet and spicy flavor mixed with their own tropical salsa was impressive! Also, huge bonus points that they allowed my puppy to hang with us and welcome all customers dogs to dine along side them. From PB we traveled down to La Jolla to my favorite fish market in town, El Pescador! The fresh salmon sashimi here is like butter! Truly nothing like it anywhere else! But today we were here to try together their fish tacos for the first time. The tacos are served with a side of cabbage salad which complimented it nicely. We ordered a few oyster shots that were fantastic! The taco itself was good, especially the clear quality of the fish used but pretty standard compared to the other places we had previously visited. 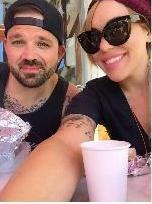 We had ONE more taco to visit back in Ocean Beach and made our way there. The sun was starting its descend as we parked the car by the OB pier. The salt in the air, the faint sounds of several musicians down New Port beer on concrete shells crowded in small baskets for sell. 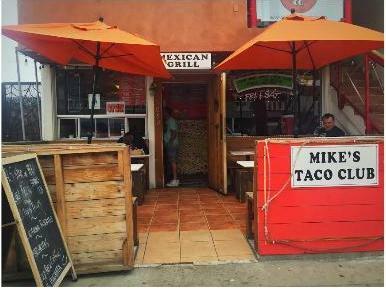 We asked several OB locals where the best fish taco was and 5 out of 5 insisted it was the grilled fish taco at Mike’s Taco Club was whats up. We went into the small taco shop and were greeted with friendly staff, boasting indeed about their grilled fish tacos. We ordered four, sat down , and prepared for our last meal together. Time stopped, we had found “it”! THE BEST FISH TACO by both local and tourist standard! The detail that set this edible ocean decadence over the top was Mike’s three sauce options. Personally I found using a generous and equal amount of all three sauces on the taco direct set it in to its own world class and crowned this taco, the absolute BEST FISH TACO in San Diego. After our swelled stomachs could take no more, we hobbled off the patio of Mike’s and cruised to Sunshine Company Saloon for a beer on the roof to cheers the day, the week, the happenstance of it all. It felt good to have walked alongside Shawn’s shoes, adventure for a moment out of my neighborhood and find a new favorite after 33 years of stubborn accounts and clingy prejudice of the familiar. Sunny Rey is a local published Poet and contributor of psychobabble. I kindly disagree… tried a fish taco from Mike’s and was not impressed. On the other hand, Mike’s surfer California burrito is bomb… just not the fish tacos. San Diego fish taco tour a worthwhile tilt, for sure. I’ve sampled around town only here and there, but I love the Baja fish tacos at Puesto at the Headquarters, traditional but refined, cuisine. Mike’s Taco Club is the Best!! (yes better than South Beach) but the tacos are between $4.50 and $6.00 so not cheap but incredible! I recommend the Pulpo taco. Newer Article: Will the Trump Campaign Wipe Out in California?